It’s the trend of the age to flaunt painted nails which not only enhances your beauty but also adds to the personality and attitude by leaps. Apart from matching nail colors, girls are also addicted to various sparkle nail art designs that rule the roost of the age. Hence, it can be confidently stated that just like nail colors make an indispensable part of a girl’s makeup kit… so is nail polish remover. 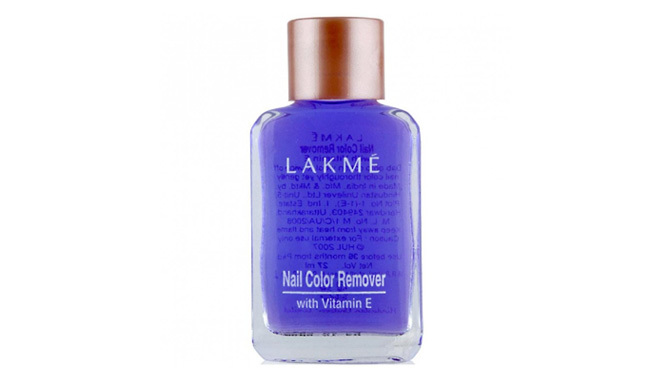 Lakme Nail Remover is undoubtedly the most popular and widely used product in India. Packaged in a small bottle, this nail remover cleans your nail in an effective and effortless way. For sensitive nails that demands more care, Revlon’s Extra Gentle Nail Enamel Remover is designed to perfection. It is not only acetone free but also formulated with various nourishing elements such as calcium and potassium, thus keeping your nails strong and healthy at its best. It also holds the natural glow of your nails in a gentle way. Here is another nail color remover that provides with easy cleaning benefits. Formulated without acetone, this remover item has vitamin E which keeps your nails nourished better. Moreover, this nail polish remover also claims to prevent dryness of the nails. Colorbar is another cosmetic brand that is gaining rapid attention in India. The nail polish remover from Colorbar is provided with natural Emollients that not only cleans the nail but also conditions and nourish it. It is also formulated with protein and vitamin to hold the natural health and radiance of your nails. Packaged in a small and attractive bottle, the nail polish remover from Street Wear prevents spillage completely. It is pocket friendly and removes all nail color stains in an effective way. The nail polish remover from Avon is designed in a small white bottle that is provided with a plastic stopper at the top to avoid leakage and spillage. It is also acetone free and cleans your nails in a gentle way. The remover has a mild soothing fragrance that stays for few minutes, ensuring no harm to your nails. With Anna Andre Nail Polish Remover also you can easily clean your nails, along with nourishing them with vitamin E and other healthful essence. This item is acetone free and enriched with many natural ingredients that ensure hygiene and health for your nails.